Tienda is a premium Magento template for Magento Community edition 1.5 and higher. 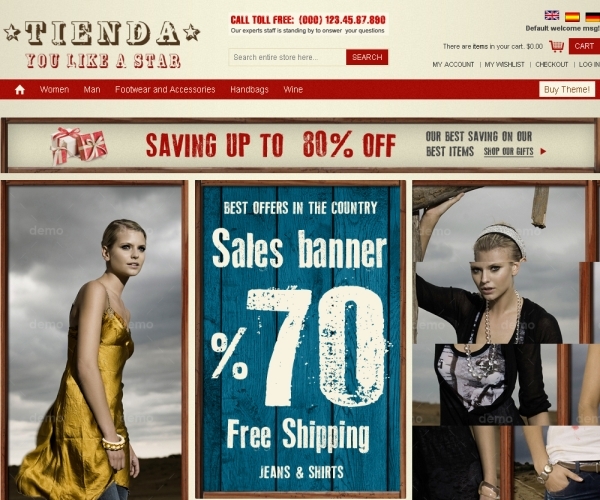 It can be used for all kinds of online stores such as those selling apparel, accessories, electronics, mobile phones etc. The theme comes in a flexible design scheme that can be easily customized to suit your requirements. A unique 3 column image slider helps you easily create a slideshow of your features products. The theme also comes with extensive navigation options such as a primary Megamenu for all of your product categories. Homepage: The homepage comes in a default brown and red color scheme along with an attractive 3column image slider. It’s followed by a second slider for your featured product categories. The footer comes with embedded social media icons and an opt-in box for newsletter subscription and also allows you to add custom extensions and widgets. Navigation: The theme has a primary Megamenu which can have multiple columns of your internal sub-categories along with a provision to add video clips, images and other custom widgets. Account management and language options come within a different menu icon within the top block. The theme also has a provision to add internal quicklinks in the footer. Your internal product pages can have multiple images as well as user reviews. A Cloud Zoom feature allows users to see a magnified version of the part of the image as highlighted by the on-screen mouse pointer. Users can also submit product reviews and can also add tags. Internal product pages come with embedded social media icons as well as a tabbed content extension which allows you to organize all your product descriptions within the same content space. Pricing: The Tienda premium Magento template is priced at $75 and suits Magento community edition 1.5 and higher.